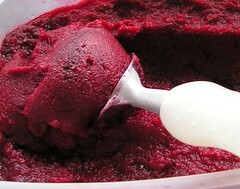 Raspberry merlot sorbet - Do You Know The Muffin Man? Adapted from the Blackberry Sorbet recipe in The Secrets of Baking by Sherry Yard. Notes: Made using red (picked) and black (bought) raspberries from Hutchinson Farm. Crushed berries with a potato masher while simmering the sauce (she says that blitzing them in a food processor turns it cloudy). Took almost two days to freeze to a slushy consistency. Intense wine flavour, not enough berry.